I got 7 Perfect Philosophy stones form event Craft master before, but when new same event started, i lost my 7 Perfect Philosophy stones. The same thing happened to my Flash cards of 7 Heart and Flash cards of 7 Spade. Please check it for me, thank you. 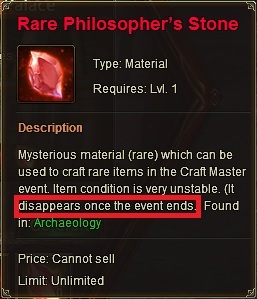 Come on people, this isn\'t the first time this happens... Next time read the description : Item disappears after event ends. 2019-4-21 14:57 GMT+8 , Processed in 0.059576 second(s), 46 queries .